Can Tennis Save My Life? The title may be a bit of hyperbole, but I am 42-years-old, I need to lose weight, and I have a stressful situation surrounding one of my children. 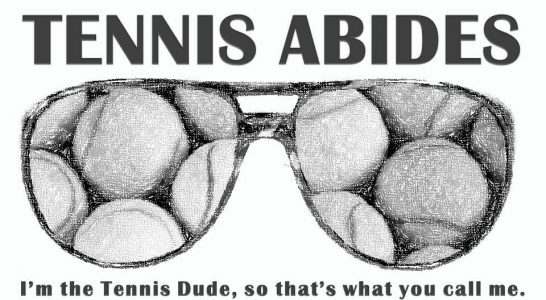 I don’t know if you have noticed, but Tennis Abides has had a bit of a sporadic last 12 months in terms of my ability to post. Is tennis a key to keeping fit, de-stressing, and finding balance not just for me, but for my entire family? Almost certainly. All three of my children like tennis. They have enjoyed being around the Saint X tennis team for whom I am an assistant coach. Today, we did some basic 10 and Under Tennis exercises prior to rain curring our day short. I got out in the sun, we all moved around, we laughed, and we smiled. I have played tennis close to 20 times in recent months after taking over three years away from the sport (largely due to familial responsibilities). Now that my children are older, we can manage some familial duties by doing things with tennis. I am coaching again for the first time in three years. I am playing some, and love how much my kids are interested in tennis. 10 and Under Tennis is fun and makes tennis more accessible to children who may struggle with full-sized courts and the ilk. Fun with kids helps everyone stay fit, and activity decreases stress for all of us. Tennis can help with weight loss and/or remaining fit. Tennis is a sport for life. My father is 71 and plays tennis three times per week. I am around high school students when I am coaching. It is not uncommon to find juniors hitting next to senior citizens at local tennis clubs. This makes tennis something that can be embraced and practiced for years to come rather than a short-term jolt of familial fun. While I generally found USTA junior tennis to be stressful, I think tennis done the right way can be exceedingly good for general peace of mind. Tennis can be good for people with Autism Spectrum Disorders. My son loves being around tennis courts and watching tennis. He is not yet showing interest in picking up a racquet, but if he does, we can quickly get him involved in the sport. For now, he is loving spending energy running near the court while grabbing and enthusiastically returning any stray tennis balls. The more I am able to just enjoy court time with my kids, with my dad, with my team, and with anyone else who happens to want to hit, the more weight and stress I can lose. A happier me is probably better for everyone in my life. Previous Post 2018 and the ATP Tour – 2003 Redux? I hope to keep plugging away and keep learning how to do 10 and Under Tennis instruction too.